Today I wanted to talk about another great T-rex pedal off of their ‘slim’ line as I like to call it. 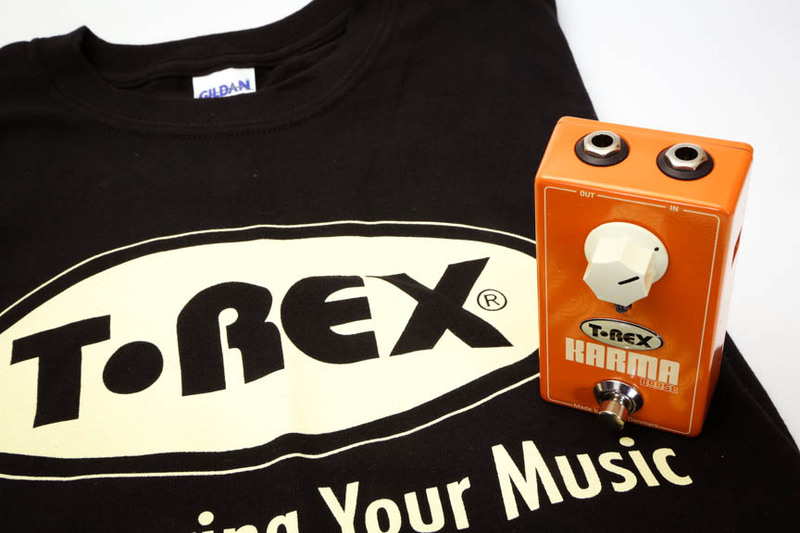 Normally T-Rex pedals are housed in a double sized enclosure, but are now offering classic single unit enclosures. This is especially great if things are getting tight on your board. Space can be hard to come by! The fine folks at T-Rex (Musiquip) were great to send me a few pedals to check out, and today I wanted to talk about the T-Rex Karma Boost. As I have mentioned in pasts before, I do like a great clean boost. If you’re running tube amps or like to overdrive pedals, clean boosts are fantastic. Basically, the concept is to increase your signal while preserving the original signal’s tone! They’re extremely simple to use, usually one knob and one footswitch, and just dial it to taste. 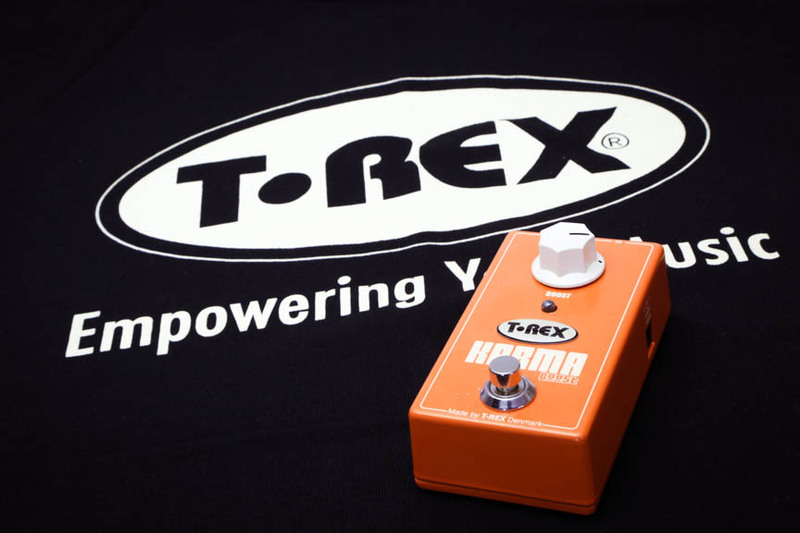 The T-Rex Karma Boost is a great sounding clean boost. The first prerequisite for a good clean boost.. is the transparency of the signal, and the Karma Boost checked out with flying colors. Lowering the boost signal fully counter-clockwise gave you unity gain. While turning the pedal on and off you should not hear a difference in tone or volume, and the Karma acted perfectly on this initial test. Raising the boost, the signal got louder and louder. My preamp tubes started to saturate, but the original tone was the same. Using this in conjunction with a dirt pedal of some sort also reacted excellent. With the T-Rex Karma Boost, you can gain 16dB of signal.. which is a ton! The Karma uses a non-linear boost circuit, and incorporates a great buffer (I’m a big fan of buffers too – should read about buffers here). One simple pedal, so many uses. Rely on your KARMA to make sure your solos cut through—even if your soundman isn’t quite on top of it. Use it to compensate for power lost across long cables and lots of pedals. Let it accentuate the gain and sustain your overdrive and distortion pedals are giving you. Or use for no other reason that it’s one damned great sounding effect. If you’re looking for a high quality clean boost, definitely check out the T-Rex Karma Boost. The T-Rex Karma Boost is currently available via Amazon for $199 and includes free shipping. Please let me know what you think of clean boosts in general or the Karma Boost by commenting below! Also.. you see that t-shirt with the pedal? I’ll give that shirt away to a random commenter below! Let’s do it! Sorry.. I only have one size… still.. free shirt! THERE HAS BEEN SOME CONFUSION. I’M ONLY GIVING AWAY A SINGLE SHIRT. THE PEDAL IS NOT UP FOR GRABS. SORRY FOR THE CONFUSION. Clean boost with a buffer? Sounds good to me. 🙂 Buffers are *way* underrated. Perfect as a first in the signal chain. Just bought the T-rex Replica plus the Octavius model, and they are awesome solid pedals. Really like the boost on the Octavius, but this new T-rex Karma boost is amazing, and absolutely a “Must Have” on the Tone-Trunk together with the other great T-rex pedals. I would love having one of these with me on the scene here in Denmark. T-Rex makes such great stuff, I wish I could afford most of the pedals in their line. that karma just ran over my dogma. A good clean boost/buffer can really help get that slight breakup or tasty crunch at lower volume levels. I want one! TRex makes some great pedals. They can be a bit pricey IMHO, but they are built like a tank. When you can find one on sale, try it. You won’t be disappointed. Does Lou Remondelli know about this? Pure as the driven snow. I love it ! thanks for this opportunity. Lou.. my random num generator selected your comment! Shoot me a message. Good shot Lou! Exactly as it should be.